John Adams—America’s second president—is a man to imitate. Brilliant with an inexhaustible love of books (“let no girl, no gun, no cards, no flutes, no violins, no dress, no tobacco, no laziness decoy you from your books”), Adams, the son of a poor farmer, read Cicero in Latin, Plato in Greek, and was fluent in French and Dutch. He helped craft the Constitution and signed the Declaration of Independence. He wrote the Constitution of Massachusetts, the oldest functioning written constitution in the world. His son became the sixth president. There are a heap of reasons to read this Pulitzer Prize winner. Here’s five. First, it is important for us as Americans to be well-versed in our nation’s history. 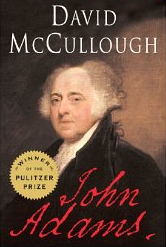 McCullough chronicles the birth of the United States from the start of the American Revolution up until America’s 50th anniversary, July 4, 1824—the same day both John Adams and Thomas Jefferson died. Adams should be praised for proposing a government of “laws, and not of men” but rebuked for pushing non-elected, lifetime appointments of Supreme Courts justices. On one side you have the Federalists of Adams, Hamilton, and Washington who wanted a strong federal government, on the other the Republicans of Monroe and Jefferson who were pro-French and believed that government is best which governs least. We’re given a tour of Robespierre and the French Revolution, Alexander Hamilton, the beheading of Louis XVI, the Louisiana Purchase, Bonaparte, the Reynolds Affair, and the yellow fever epidemics. The greatest shiner of them all was this account from Congress Hall. Roger Griswold of Connecticut insulted Republican Matthew Lyon of Vermont, Lyon crossed the chamber and spat in Griswold’s face. Son after, Griswold retaliated with a cane. Lyon grabbed fire tongs from the fireplace, and the two went at each other until, kicking and rolling on the floor, they were pulled apart (494). By this standard, today’s politicians are softies. Third, young men need examples of courage not just from warriors with swords but statesmen with pens. Bookish men can be gutsy and fearless too. As a thirty-four-year-old lawyer he chose to defend the soldiers responsible for the Boston Massacre. He signed the Declaration of Independence, a crime punishable by hanging. He sailed to France as a diplomat for aid though he didn’t know a word of French. Risk is right, as John Piper says, and that may mean a missionary must go to the field without any kind of health insurance—which I took to be McCullough’s point. Fourth, the greatness of our nation is not an accident. Our founding fathers promoted a balance of powers because they knew that (as Defoe said) “all men would be tyrants if they could.” The thought, skill, and care by which they wrote our nation’s laws are immeasurable. That Adams and Jefferson continued correspondence at all is astounding. The former a born-orator, a religious Federalist, a hater of slavery and confrontational. The latter an atheistic Republican slaveholder who was peerless with his pen. In their declining years they began what McCullough calls “one of the most extraordinary correspondences in American history—indeed, in the English language” (605). It may have been the letter Jefferson didn’t send that was most costly. As VP to John Adams, Jefferson wrote what “could have been one of the most important letters he ever received” but was talked out of sending it by James Monroe. The moral: bestow encouragement when it is there to give. To the jury at the Boston Massacre trial: “Facts are stubborn things and whatever may be our wishes, our inclinations, or the dictums of our passions, they cannot alter the state of facts and evidence” (68). His first line in the Declaration of Right stating that all men were “born equally free” was changed to say that all men were “born free and equal”, a change Adams didn’t like because he did not believe all men were created equal except in the eyes of God. He said, “I must study politics and war that my sons may have liberty to study mathematics and philosophy” but what his sons needed more was a father at home. Two of his three sons were drunkards. Today’s battle of titles in the ecclesiastical world such Reverend, doctor, Pastor, Pastor John, Pastor Smith and so forth was also a major issue on the political front among the founding fathers. This matter title for the President occupied the Senate for nearly a month. “No title of nobility shall be granted by the United States,” says the Constitution. “Mr. President” won out. This entry was posted in Book Reviews and tagged 2015 Review, biography by Paul Schlehlein. Bookmark the permalink. Has been on my list to read for a long time. I need to buckle down and read. Was convicted by your statement that friendship and writing both take work. True. So true.